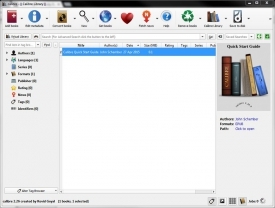 "An e-book library management application." An e-book library management application for your entire e-book library, Calibre gives you the opportunity to download, store, and organize all of your e-books all in one place. With a very simple to use and navigate interface, you will not have any hassle going through your entire collection without a hitch of effort. With the simple interface, there is nothing you need to learn about navigating the application - you simply add your books and you are good to go and will be able to easily find them again when you need them. The application's purpose is to store and organize all of your e-books in one place so you will be able to find them whenever you want. You can download them and add them to the directory, or you can add the e-books you already have on your computer. Either way, you will have absolutely no trouble storing and finding all of the books that you have in your library - no matter the type of book or whenever you added it to your library. Calibre also gives you the opportunity and features to convert your e-books, and it will read from all of the major e-book file formats so you do not have to worry whether or not your e-books will work with Calibre or not. As long as you have an e-book that is primarily used on a common device, you should not have any problem using it with Calibre. Though, you are still able to convert the files to a proper format for Calibre by using its file conversion tool. Whether you are an avid e-book reader, or just someone that reads from time to time - Calibre is a useful tool that you can use to organize and store your e-books for later use.